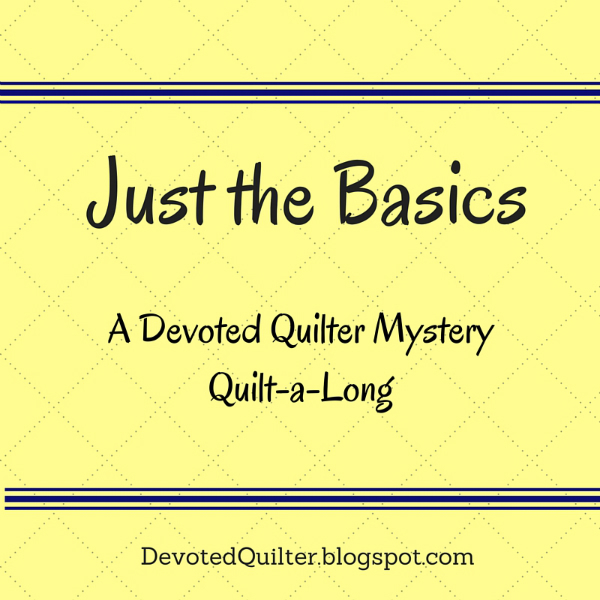 Welcome back for the next installment of the Just the Basics mystery quilt! It's never too late to join in. All of the posts can be found under the tab at the top of the blog, so you can start anytime. New posts will be published here on the first Wednesday of each month. You can follow Devoted Quilter by Bloglovin, email or Feedly to be sure you don't miss anything - the links are all on the sidebar. Last month was fabric selection and this month we get to start cutting that fabric up and sewing it back together! 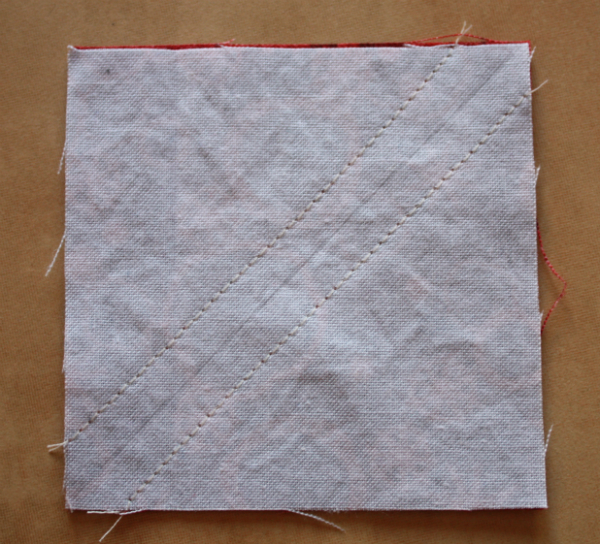 We're starting with one of the most basic units in quilting - the half-square triangle, or HST. HSTs are used in so many different quilt designs, from pinwheels and chevrons to stars and herringbones. Check out my HST Quilts board on Pinterest to see some amazing ideas for using HSTs. 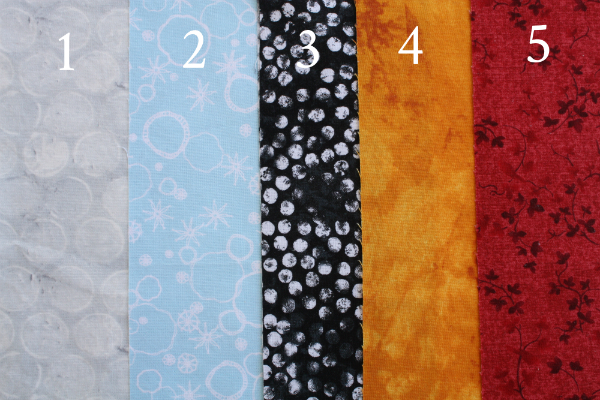 Just as a reminder, here are the fabrics I've selected for my quilt. 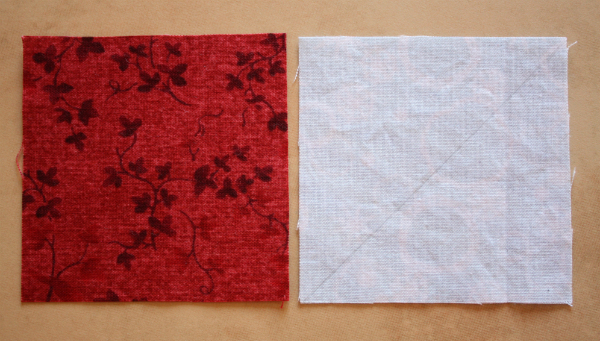 This month we'll be using Fabrics 2 and 5 to make our HSTs. In my fabrics, that means I'll be using the blue and red fabrics. For the baby/wall size, you need 128 HSTs. For the throw size, you need 240 HSTs. Before you panic about making so many, let me assure you that we won't be making that many units every month! I figured I'd start with the highest number, get that out of the way as soon as possible and then all the other months will feel easy :) Also, we'll be making them two at a time and chain piecing them, so although the number looks big they come together pretty quickly. We'll also be making them slightly larger than needed and trimming them to the proper size. It's an added step, and a bit tedious, but HSTs are notorious for being just a little off, no matter how carefully you cut and sew. Making them big enough to trim means they'll be perfect when you're finished, and that makes assembling the quilt top much, much easier. It's definitely worth the extra time spent trimming. From Fabric 2 - 64 squares 3" x 3"
From Fabric 5 - 64 squares 3" x 3"
From Fabric 2 - 120 squares 3" x 3"
From Fabric 5 - 120 squares 3" x 3"
Choose which of your two fabrics is lightest and draw a diagonal line from corner to corner on the back of each of those squares. My blue fabric is lighter than my red one, so I drew the lines on my blue squares. This step seems to go faster if you are watching TV or otherwise engaged in something else at the same time! 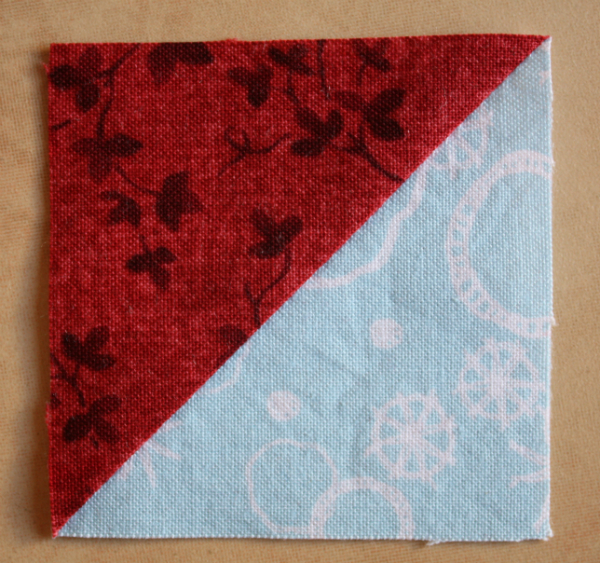 Pair a Fabric 2 square with a Fabric 5 square, right sides together, and pin. Do this with all your squares at once so the whole pile will be ready for chain piecing. Stitch 1/4" away from the line on both sides. Don't break your thread between squares, just keep feeding them into your machine with only a couple of stitches between them to create a long chain of squares. Chain piecing in this way is much faster and reduces thread waste. 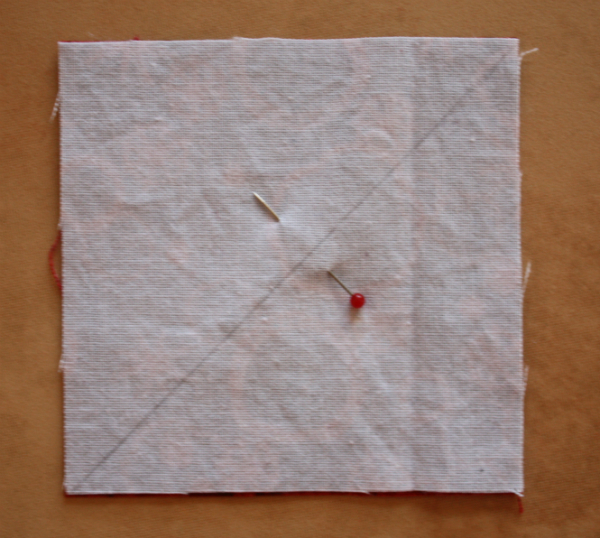 When all the squares are sewn, cut the threads joining them. Cut the squares apart on the drawn lines. Now, I'm going to show you how I trim my HSTs. 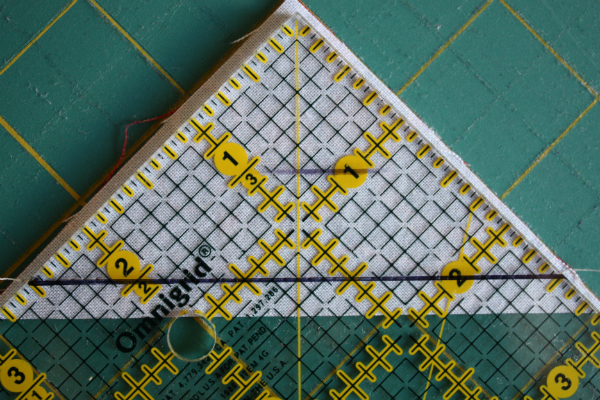 If you have a Bloc Loc ruler, then by all means press your blocks open and trim using that. I don't have a Bloc Loc ruler, though, and I trim my HSTs before pressing them open to make it a little faster. I have a 4" square ruler that I usually use for trimming my HSTs, unless they're bigger than 4". 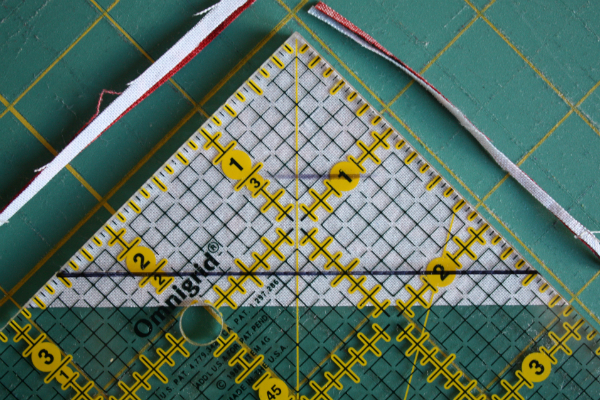 I have used the same method with a 6" x 24" ruler, so if you don't have a small square ruler you can still trim HSTs this way. The first step is to turn the ruler on point and find the proper measurement for trimming your HSTs. 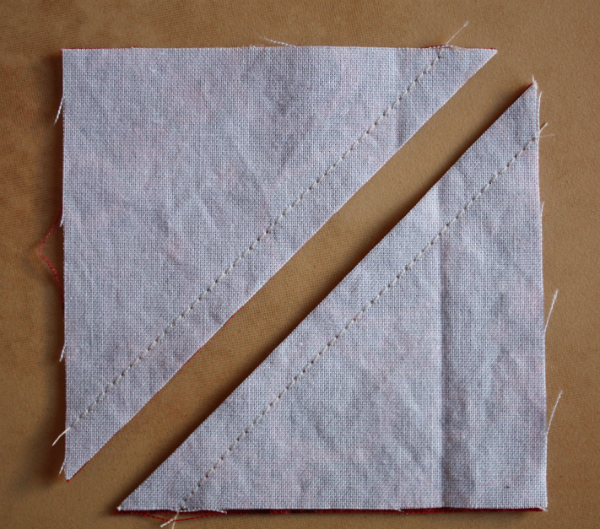 For this quilt, we need to trim them to 2 1/2", so find 2 1/2" on either side and mark a straight line from one side to the other. I have mine marked with permanent marker, but I've also taped paper across the ruler to mark the line when I was using a friend's ruler. I've also used masking tape and painter's tape...whatever was on hand at the time! Please ignore the extra two lines on my ruler...I've also marked it for trimming 1 1/2" and 3 1/2" HSTs. Place your HST unit on your cutting mat. 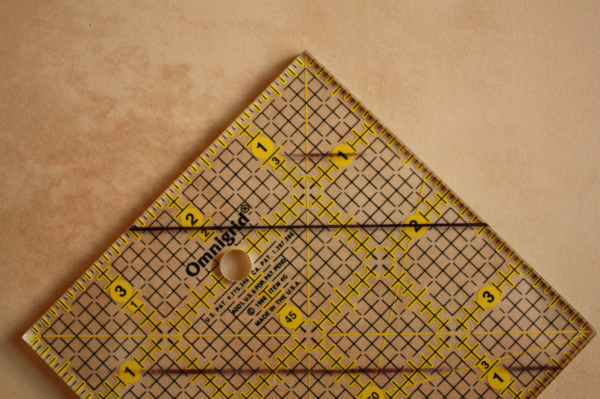 Position the line on your ruler directly on top of the stitched line. Press the HSTs open, trim off the dog ears and you're done! I can't wait to see the beginnings of your quilts! Tag me if you post your progress on Instagram (I'm @devotedquilter), leave me a comment here with a link to a blog post or even just email me a picture (devotedquilter at gmail dot com). * This post contains an affiliate link, which means if you click on the link and then make a purchase I may receive a small commission. This does not affect the price you pay. I've decided to join you! I'll get my fabrics picked today and get started! Thanks, this looks fun. How fun that you've started a quilt along Leanne! My to-do list is too long to let me join in but I hope you all have a great time! I'm a beginner so I'm going to do my best to follow along. We'll see how it goes.